When we imagine the Art Deco period our mind travels towards images that dazzle – a world of youth, excess and abandon; of glamorous men and women dancing to jazz and exuding Hollywood glamour. Art Deco style – from its furniture to its fashions – is a glittering, instantly recognisable, backdrop to life. We know too, that the 1920s and 30s were a period of enormous change. Collective post-war grief and years of plenty gave way to the grinding poverty of the Great Depression. A shift in energy, from the old world to the new, accompanied rising nationalism, consumerism and industrialisation. It can be hard to understand the Art Deco images we conjure as a product, and driver, of the forces at work on the western world. 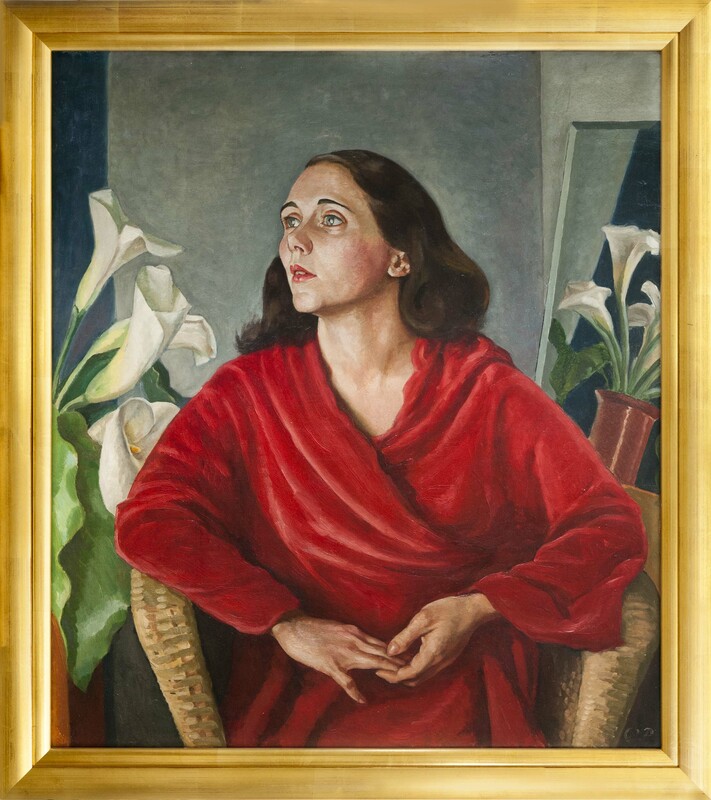 In 2012 the Friends of the Hawke’s Bay Cultural Trust purchased an arresting portrait of a woman, painted in New Zealand in 1931 by British artist Christopher Perkins. The year – 1931 – is of course the year of the Hawke’s Bay earthquake, an event to which we owe our interest as a city in all things Art Deco. As an institution seeking evidence for the development of the style within its own time and wanting to untangle its impact on lives lived in the period, the portrait is a particularly resonant gift. For a long time the world knew the sitter only as Mrs Michael Stiver, and the official name of the work remains Portrait of Mrs Michael Stiver. Like so many women of the period, the subject of portrait somewhat unknowable through the use of her husband’s name. However on acquiring the portrait we began to piece together her story and what we found of her charmed us. In the woman we know now as Annette (though always Andy to her friends) we have found someone to conjure with. In her modernity, her glamour and impetuosity and the twists and turns of her life we had a true tale with all the makings of a Hollywood film. As a portrait of a young woman living in New Zealand in 1931, Andy’s portrait is a rare for its directness, uneasy intimacy, womanliness. Andy is not conventionally beautiful, her features are almost too strong, but we are drawn to her face – her upturned nose, sculpted brow and red lips. Our gaze is drawn to her hands as she plays with them uneasily in her lap. She wears no jewels; her hair is pushed simply away from her face, she sits informally, looking away but leaning toward the viewer in a loose, dark-red gown. The simple backdrop of Calla lilies behind Andy and reflected toward the viewer intrude on us with their starkly sexual allusions. Hints of an intriguing personality breathe life into the fragments of her story. Annette was born as Julia Anderson (she changed her name after leaving school) in upstate New York into a wealthy small-town family in 1901. She was a bright and clever student. In 1923 she married for the first time. When the marriage soured within a few years Andy began working for F L Carlisle, a rather unsound Wall Street investment company of the type that precipitated the stock market crash. New York in the mid-twenties would have been an exciting place for a young woman, heady times too – she was likely in the thick of the action as the chaos of Black Tuesday unfolded. Then, on 2 April 1930 Andy appeared in the press in an article titled ‘Given divorce Carthage woman weds next day.’ In a bold move, equal to a modern Hollywood heroine, Andy had indeed divorced her first husband and secretly married advertising executive Michael Stiver of the firm J Walter Thompson the following day. The couple stole away to Canada and sailed immediately for Wellington. Michael was charged with opening a New Zealand branch of J Walter Thompson to manage the promotion of products of the new General Motors assembly plant in Petone. It was particularly bad timing for such a venture. The shockwaves of the stock market crash followed in the wake of the Stivers as they sailed to New Zealand and sales of luxury consumer goods such as cars soon plummeted. 1920s Wellington must have come as rather a shock to the couple, used to the extravagance of New York City. However they soon became friends with a small circle of Wellington based artists, writers and academics. While all relatively well-off it was a group that had little in common with the middle class conservatism of many of their peers. Christopher Perkins and his wife Berry were part of this circle. Perkins had been recruited in Britain under the La Trobe Scheme, a programme to import teachers from England with the intent of improving the quality of art education in New Zealand. He had come to Wellington with his family in 1929 to teach art at Wellington Technical College. The Perkins’ daughter Jane remembered Andy as a ‘fine boned intense little woman with a swathe of dark hair’, who, half in love with Perkins, held ‘a profound and touching adoration for himself as well as for his work.’ We might speculate that this amour is the reason for the palpable intimacy and unease evident in the painting; it suggests at the very least an unconsummated emotional entanglement between artist and sitter. We know at least it is a work that captures something of a kindred spirit at the start of what would be an enduring relationship. Andy was a determined and admiring friend, patron and promoter of Christopher for the rest of her life. Andy sat for the portrait over a number of days in the converted studio basement of Perkins’ rented home in Kelburn. We see her in a home-made dress, upon a rattan chair brought down from the kitchen above, and posed amongst calla lilies picked from the garden. After the morning sittings she would stay on for lunch with the family, bringing along her sewing machine so she could teach dress-making to Berry, and their two young daughters. One wonders what Michael made of the work he commissioned? Andy treasured the portrait – it only entered the open-market after her death – and years later still signed off her letters to Christopher with a lipstick saturated kiss. Back home in America, Andy’s family lost all their money in the stock market crash. Then, just months after the portrait was painted, the Wellington branch of JWT closed its doors due to unprofitability. The couple, ever resiliant, moved on to Australia and Michael took up the management of the Sydney branch of J Walter Thompson. Andy and Michael soon became part of Sydney’s ‘smart set.’ Andy started writing a regular column on fashion and shopping for Sydney Ure Smith’s The Home magazine – a periodical that embodied the aspirations of ‘Modern Sydney’. What we now recognise as the quintessential Art Deco look was emblazoned across its pages. Its readers were not avant-garde or revolutionary; they didn’t disdain commerce but admired taste, refinement, intelligence and style. In these pages we hear Andy’s voice for the first time – witty, enticing and elegant, cajoling middle-class women into the latest fashions. The Sydney lifestyle was a perfect fit for Andy; she had just the look and the voice for promoting an achievable local ideal and encouraging the spending that would entrance advertisers. After a few years the Stivers moved on to the UK (reconnecting with the Perkins who had since moved back home). By 1940 she and Michael had divorced, Michael moving to Buenos Aires and marrying a local woman, Andy moving back to her native New York. By the mid-1940s Andy has established a career working for one of New York’s biggest advertising firms as a copywriter, eventaully heading up the department. She married again, but divorced just a few years later in 1959. Andy died in New York in 1996 and is buried in the family cemetery of her first home. While we can now only catch glimpses of Andy’s life her enigmatic portrait commands attention and captures the imagination. Her life and look is instantly recognisable as that of a twentieth century woman, and it is through stories like hers, sparked through the acquisition of such a striking portrait, that we can rediscover and reinterpret the Art Deco decades with renewed vigour. Portrait of Annette Stiver by Christopher Perkins was purchased by the Friends of the Hawke’s Bay Cultural Trust. The portrait will be on display when MTG Hawke’s Bay opens this spring. This article was first published in the Newest City News, May 2013 and is kindly reproduced with the permission of the Art Deco Trust.